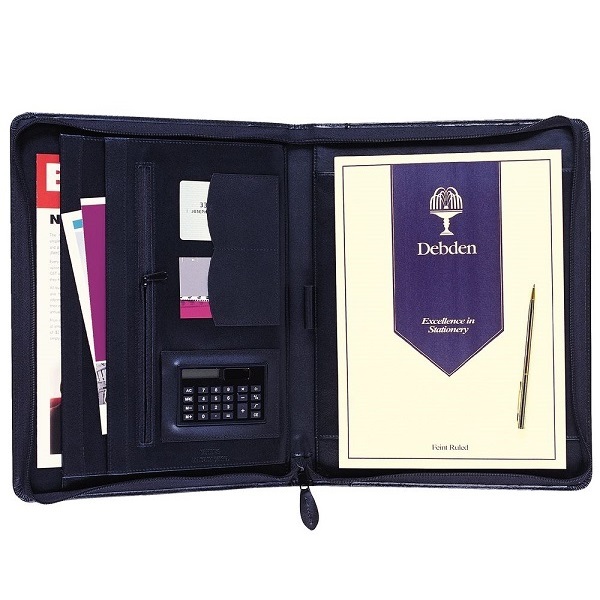 Stylish Black Polypropylene (PP) Compendium with 5 convenient pockets. All pockets tabbed for easy identification and access. Tab inserts included. Pockets for business cards, CD holder, notepad and pen. Pen not included. Made from heavy duty, environmentally friendly PP which will not wear out or tear. Secure front fastener to keep your compendium closed and secure. Practical A4 Leather Conference Compendium with pad. Features PU cover with rounded corners. Clear business card pocket with inside document compartment. Complete with an A4 lined note pad and ballpoint pen. Quality A4 Leather Conference Compendium with pad. Features rounded corners and top stitching for added durability. Clear business card/calculator pocket inside document compartments. Complete with an A4 lined note pad and stylish ballpoint pen. This professional leather portfolio zips securely around the cover. Quality zippered leather reinforced cover with stitched edge construction and rounded corners. Features include expandable pocket with 2 smaller pockets and 1 zippered pouch. 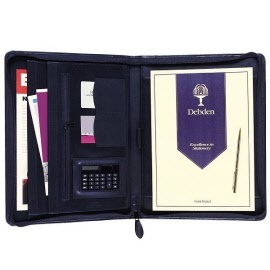 Supplied with an A4 lined note pad, stylish ballpoint pen and multi-function calculator. 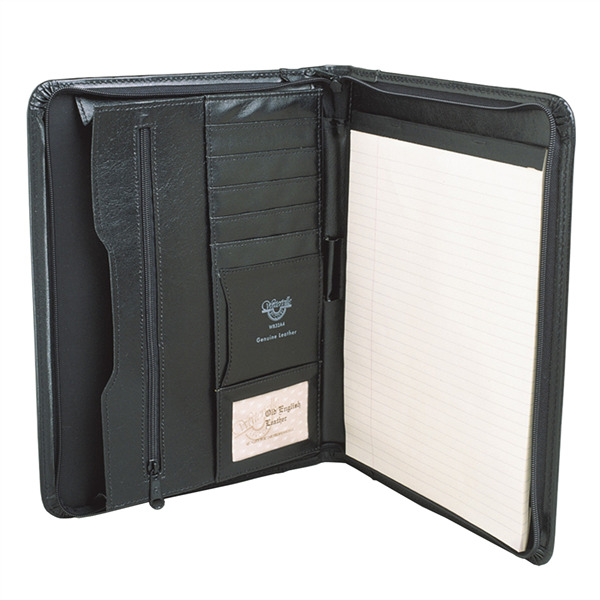 Premium A4 bonded leather zippered pad and note holder with internal storage pockets and writing pad. Quality bonded leather cover with hand turned, stitched edge and zippered padded cover with rounded corners. 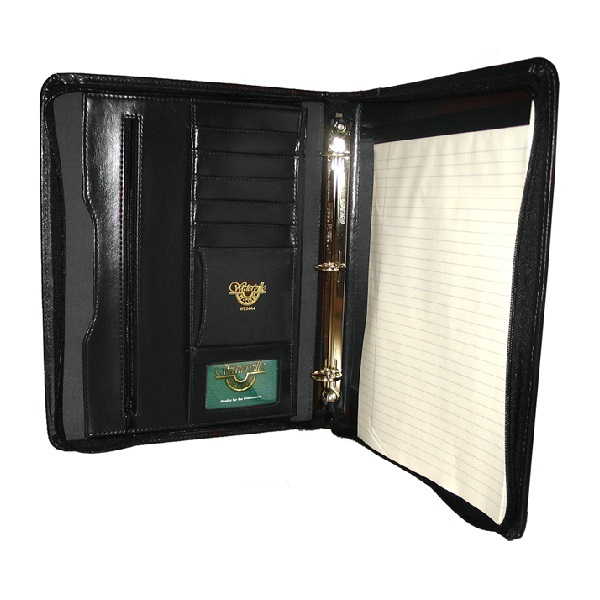 A4 pocket with 25mm gusset, A4 zippered pocket, 6 card credit card ladder, business card storage pocket and clear business card window on inside of front cover. Pen loop on inside of spine. 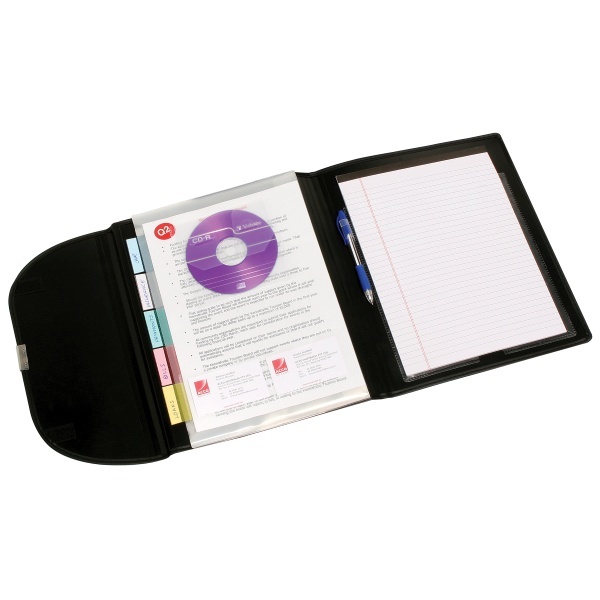 Supplied with WPA4 buff pad with provision made to insert diary in inside of back cover. 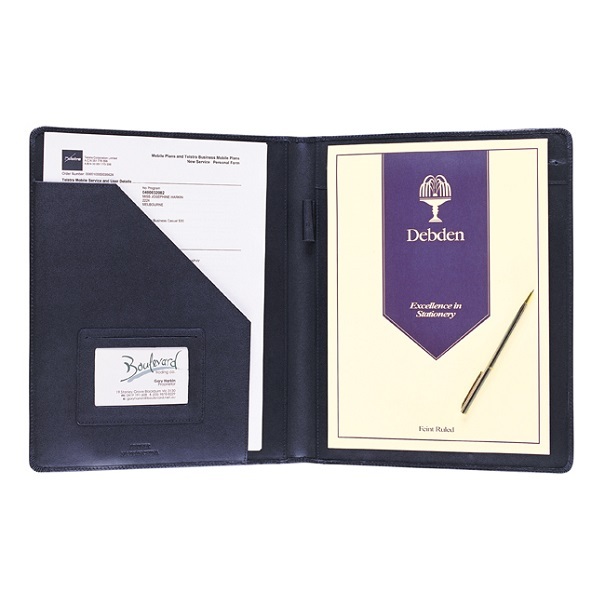 Premium A4 bonded leather zippered compendium with three ring metal fitting and writing pad. 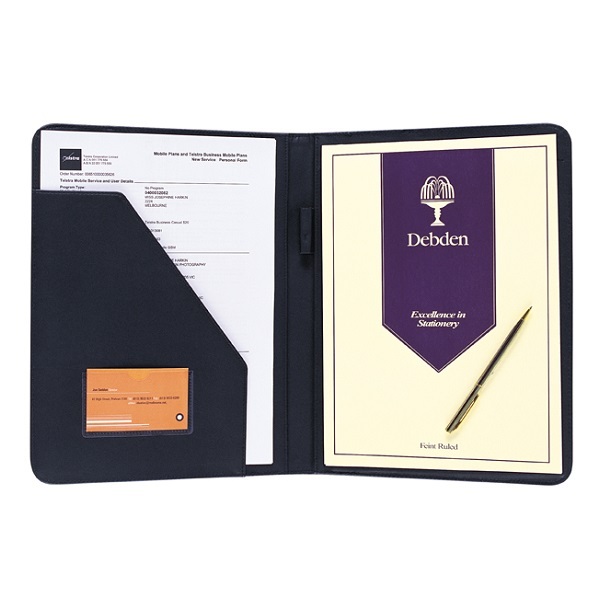 Features include A4 pocket with 25 mm gusset, A4 zippered pocket, 6 card credit card ladder, business card storage pocket and clear business card window on inside of front cover. Brassed 30 mm 3 ring "O" ring metal on inside of spine. Supplied with quality WPA4 buff A4 pad.